Some drivers just can’t get enough of the cars that are readily available to them. However, foreign markets offer an oasis of vehicles that stand unique to those that Uncle Sam loves. The trouble comes if you continue to live in the US but have an extreme affinity for importing cars as there are some forbidden fruits you may never be able to taste. Open up an auto enthusiast publication and website and you’ll quickly learn that our car market is missing some key European and Asian treasures. It might be due to perceived lack of market interest, inability to comply with American safety regulations and emissions standards, or the simple inability to fund the import process, thousands of cars are produced every year that will never get the chance to burn rubber on Highway 52 or down US-1. Manufactured between March 1994 and July 1995, the Audi RS2 Avant is the first car on the National Highway Traffic and Safety Administration (NHTSA) list of cars deemed ineligible for import, even under Show and Display Regulations. The 6-speed manual was a collaboration between Audi and Porsche, and has been argued to be the car that successfully established Audi as a producer of practical high-performance cars. The 2.2L 5-cylinder 20v turbo engine can push these wagons from 0 to 60 in 4.8 seconds and top out at a max speed of around 162 mph. Unfortunately for fans in the US of A, the only way to own one of these is to establish residency in another country. American auto company Ford has put out a surprising parade of fast European Focuses during the last decade has had us simultaneously admiring the company for building them and admonishing the company for playing keep-away with its home market. We’ve been assured that the days of keeping its hottest hatches out of our hands will be over once the new world-market Focus comes online starting in 2011 as a 2012 model—but Ford had to go and twist the knife one more time. Witness the 2011 Focus RS500, the fiercest Focus ever and what the company considers to be the successor to the legendary Ford Sierra RS500 racer of the 1980s. The Focus RS500’s 2.5-liter inline five-cylinder engine has been juiced up some 45 hp and 14 lb-ft of torque from its appearance in the Focus RS; here it makes 345 hp and 339 lb-ft (it can hit 62 mph in 5.6 seconds), achieved mostly through breathing enhancements instead of additional turbo boost. The wide track and a revised limited-slip differential developed for the Focus RS are said to be able to handle the additional torque of this particular front-wheel-drive pocket rocket. With only 600 ever made, the third M3 Sport Evolution featured a 2.5 L engine designed to compete against Audi’s v8. With the creation of the M3 line, BMW designed a new 4-cylinder engine to replace 6 cylinder being used in the E30, which was too long to fit inside a car designed for every-day use. The stock engine created an easy 200 bhp, with the competition spec engine putting out 300 bhp at 8,000 rpm. Though listed as one of the NHTSA’s banned cars under Show and Display regulations, this should be exempt from the restrictions after 2015. This Romanian-built Land Rover Defender lookalike exists because of the Hummer craze. Due to some shady business involving the company that built these vehicles and investing in them, there was never a chance for these to be open to the U.S. The Jaguar XJ220-S only had 6 examples that were produced, but that was enough for the NHTSA to ban them from the United States. The S model was designed to be a street-legal version of the XJ220-C racer. The hidden headlights of the XJ220 were removed in the S model, as well as the base model’s leather trimming. The car’s engine was tuned to produce a neck-breaking 690 hp and American Jaguar fans have been salivating over this for years. Designer Vittorio Strosek took the famous Lamborghini Diablo and modified its body, thinking it was too subtle. Modifications included the replacement of the front and rear bumper with much rounder versions, replaced headlights and turn signals, side mirrors that were places high up on the doors, and much more. Despite an output of only 118 bhp, the Lotus Elise S1 was able to accelerate from 0 to 60 in 5.8 seconds due to its 1,600 lb weight. Capable of speeds up to 150 mph, the Elise was named after Elisa, the granddaughter of the company chairman at the time of release, Romano Aritoli. The 340R was released as a limited edition model of the Elise, with only 340 ever produced. The name 340R originally referred to the power-weight ratio of the prototype, which churned out 177 bhp at a weight of 1,100 lbs. It later came to refer to the number produced when the final production found the car at a weight of 1,550 lbs. In 2002, Morgan created 80 limited edition anniversary models of the 1962 Le Mans, as well as one prototype. Each came with its number engraved on both the steering wheel and on a plaque in the console, with the prototype detailed as car “00.” Once the line was launched, all 80 vehicles were allocated to owners within 72 hours. The cars are as accurate as possible to the original model, including the installation of only one door handle, on the driver’s side. Rival to the Toyota Supra and Mazda RX-7, the Nissan R34 GT-R V-spec boasted some of the most advanced technology that a 1999 car could. It was one of the first to introduce a display screen on the dashboard that listed various statistics about the engine and car during operation, including a reading of the amount of G-forces the car was experiencing. The driver’s seat had a computer jack hidden under its seat skirt to enable uploading information from the car’s system to a laptop for analysis. A quick search around the internet instantly shows the Skyline to be the most hotly requested model of the NHSTA’s banned list. 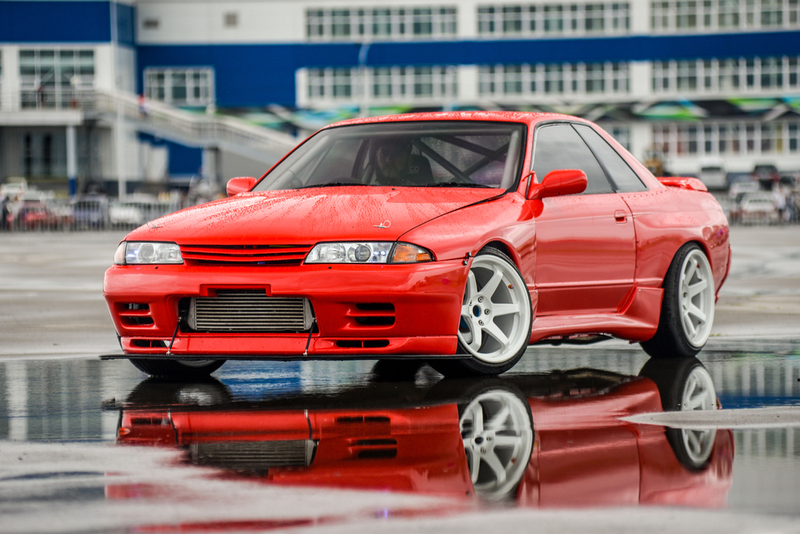 Other banned Skylines are the 1995 GTS-T, R32 GT-R’s built between 1989 and 1994, the 1995 R33 GT-R, 1995 and 1996 R33 GT-R V-spec’s, the 1994 R34, the 1999 R34 GT-T and the 2001 R34 25GT-T. The TVR Tuscan Speed Six went into production early in 1999/2000 and was in independent UK vehicle maker’s most significant car. It has a large straight six engine. The engine makes more room in the footwells for the driver and passenger’s feet and it allows for unique pedal layout. The car probably is quicker than the 420bhp, 4.5 litre Cerbera from TVR although it’s design would make recording on the track difficult. Since this car, TVR have been making inroads into the initial order bank of 1600 deposits in order to bring the waiting list down to manageable proportions. While many of those orders were from TVR’s existing customers, a far larger proportion than ever before were from people who decided to transfer their allegiance away from mass manufacturers. Due to emissions and safety standards in the US, this car has never been spotted in the US. No other vehicle of the same make, model, and model year was manufactured and/or certified for sale in the United States. No other vehicle of the same make, model, and model year has been determined eligible for importation under 49 CFR Part 593, which pertains to importation of vehicles by business entities. The vehicle is not currently in production. The vehicle was not created as a kit car, replica, or special construction vehicle. Of course, there are plenty of cars that do not meet those requirements. But the NHTSA has done applicants a favor and crafted a list of cars that are definitely not approved for import. However, there is a clause stating that cars over 25 years old are exempt from show and display regulations, meaning many of these could be pulled off the list rather soon.